Forget Disney! 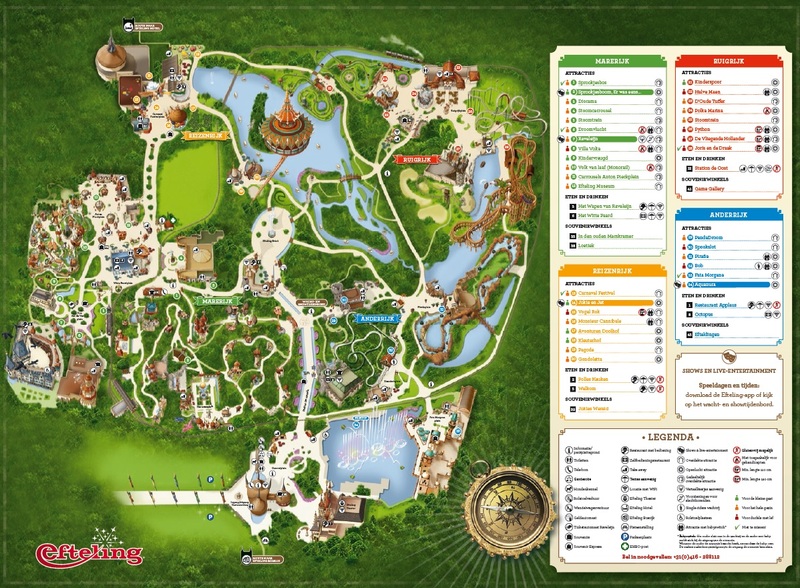 ; Efteling, located in Kaatsheuvel, North Brabant province of the Netherlands, is Europe's best ever theme park. The Efteling is one of the biggest and oldest theme parks in the whole world! It's was started in early 1950 and opened for public from 1952. It's is one of the pioneers of the theme parks industry worldwide. Walt Disney himself said he took inspirations and conceived ideas for his Disneyland from this magical park. Though there are numerous theme parks available today, Efteling always has been the favourite of Europeans and still going strong (close to 6 million visitors last year)! The entire park is themed over fairy-tales, fantasy stories, folklore and its characters. Scenes of Cinderella, Snow White, 7 Dwarfs, Hansel and Gretel, Rapunzel, Goblin, Magical Tree, and many more European folklore (which I don’t even aware of) are all evident throughout the park. There are fantasy as well as thrilling rides for all the ages. The Efteling park is separated into five Rijks/Kingdoms - each with its unique theme. Marerijk (Fairy Kingdom): is located in the west of the park, named after the “Mare” of a German fairy-tale. It hosts the main attractions of Sprookjesbos and Droomvlucht. 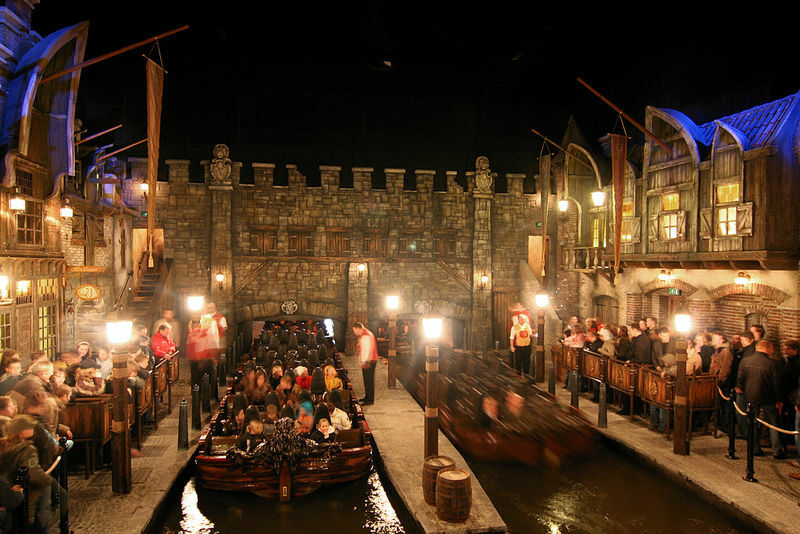 Ruigrijk (Rough Kingdom): is located in the east, has a number of attractions, Baron 1898, Joris and the Dragon and The Flying Dutchman are some of the very popular (ofcourse, rough!!)rides. Fantasierijk (Fantasy Kingdom): lies in the middle of the park, probably the first one most of us reach. It consists of Polles Cuisine, Aquanura and the very new Symbolica! Anderrijk(Alternative Kingdom): is in the south, this houses the famous Piraña, Ghost Castle, and Panda Dream. 💭Efteling mobile app can be very useful, especially they give a live update on tracking/navigation and waiting time of each of the attractions. It is one of the biggest and also the first attraction in the Efteling park (its existing since the first day, May 31, 1952). Started with just 10 fairy tales in the beginning and now there are whopping 29 tales seen alive. They’re not just exhibited, but the whole story is lively illustrated in moving statues, more like a live stage drama. Cinderella, Chinese Nightingale, Dragons, Fakir, Wolf & seven kids, Sleeping beauty, Hansel & Gretel, Frog Princess, Little Mermaid, Rapunzel Little red riding hood, Snow white…. are a few tales to mention. Here’s the complete list of 29 tales. Droomvlucht is the other super-star of Efteling. Your dream flight starts through a dark cave and taken-off to a majestic castle, between the low-lying mists, rocks, and waterfalls. With a quiet music and lots of harp and wind instrument effects, you'll feel that you’re transported to a distant dream world, for sure. I am not a big fan of rides (especially the rough ones). De Vliegende Hollander / The Flying Dutchman stands at the wilder attractions of the Efteling in Ruigrijk (Rough Kingdom), but hard to bring it in that category. In fact, I still can’t classify what kind of ride it is! An indoor dark ride, a fantasy thrill journey, water coaster, outdoor roller coaster, …it has all of them nicely blended together to give an unforgettable ride experience of ones’ lifetime. Check out here for more details. Symbolica is the most expensive Efteling attraction ever. It's built with over 35 million euros and also the biggest, built in the form of a castle. The symbolica ride is designed as a fictional story about King Pardulfus, Princess Pardijn and their naughty governor Pardoes. Waiting Time: at least 40 minutes, we waited about an hour and a half. Be prepared for it! Are you with the children in Symbolica? Yes, kids will love it, but beware that the children under 1 meter need a supervisor. You'd always pick adequate seater accordingly. Do not put efforts to make any pictures or videos inside. It is NOT prohibited, but I personally feel that there is so much to see/experience and enjoy it in live. After all seeing this wonder on screens is not that exciting. It is a spectacular musical fountain show, with special effects of more than 200 fountains, 900+ lights, with matching music beats and fire. It’s created with a theme of the “Frog King”, 4 frogs from different directions bring enchanting Efteling fairy tales to life”. The colours of Aquanura is beautiful to watch in the dark. When to visit: All through the year!... however its best enjoyed in the summer, preferably a sunny day, that you can enjoy the whole fun of waters. Public Transport: nearest stations are Den Bosch or Tilburg; you can take a bus from there. How much it costs: This will disappoint you, it’s €40 per person (online price €38), but worth the money! Getting around: As I said, it's really HUGE!, you might look gorgeous with your high heels, but definitely not a good idea to walk around this ~700,000m2 park. Pick comfortable walking shoes. I hope the above details are useful to you. Drop me a line if you need any further information. 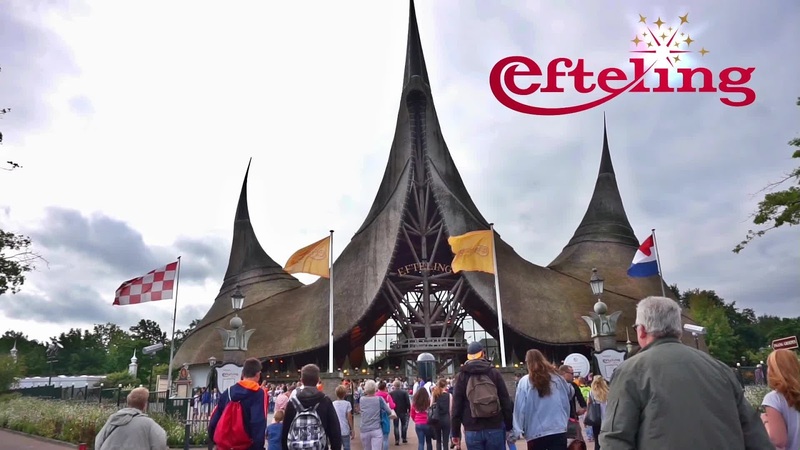 Almost from our first weekend in the Netherlands, we’ve been recommended to visit the #efteling; our friends, colleagues, and neighbors, all praised and created a lot of hype for the Efteling (Ofcourse, they are Dutch😜). Finally this summer, after crossing 100+ weekends in the Netherlands, we made it to the magical Efteling! For those of you who wonder what Efteling is: it’s a fairy-tale/ fantasy themed amusement park, located in the village of Kaatsheuvel at North Brabant province of the Netherlands. Calling it simply as a theme park in #kaatsheuvel village may be an understatement! The Efteling is one of the biggest and oldest theme parks in the whole world! It's was started in early 1950 and opened for public from 1952. It's is one of the pioneers of the theme parks industry world-wide. Walt Disney himself said he took inspirations for his #disneyland from this magical park only. Though there are numerous theme parks available today, Efteling always has been the favorite of Europeans and still going strong. The entire park is themed over fairy-tales, fantasy stories, folklores and its characters. Scenes of Cinderella, Snow White, 7 Dwarfs, Hansel and Gretel, Rapunzel, Goblin, magical tree, and many more European folklore (which I don’t even aware of) are all evident throughout the park. There are fantasy as well thrilling rides for all the ages. It’s really.. really huge, and I can’t scribble all the 2-days fun in a single post. I’d rather write individual post on each of it’s main attraction, with some interesting facts and tips. After reading all of them, you might even think it's a promotion blog for Efteling or even a paid review for them (just kidding!😜). We really enjoyed that much and wanted to share the fun with you all, that's it!. Public Transport: nearest stations are Den Bosch or Tilburg; you can take bus from there. How much it costs: This will disappoint you, it’s €37.5 per person (online price €35.5), but worth the money! Getting around:As I said, it's really HUGE!, you might look gorgeous with your high heels, but definitely not a good idea to walk around this ~700,000m2 park. Pick comfortable walking shoes. The Efteling park is separated into five Rijks/Kingdoms (don’t think of any “Walls” in-between😊, they are just a virtual separation), each with it’s unique theme. #Marerijk (Fairy Kigdom): is located in the west of the park, named after the “Mare” of a German fairy-tale. It hosts the main attractions of Sprookjesbos and Droomvlucht. 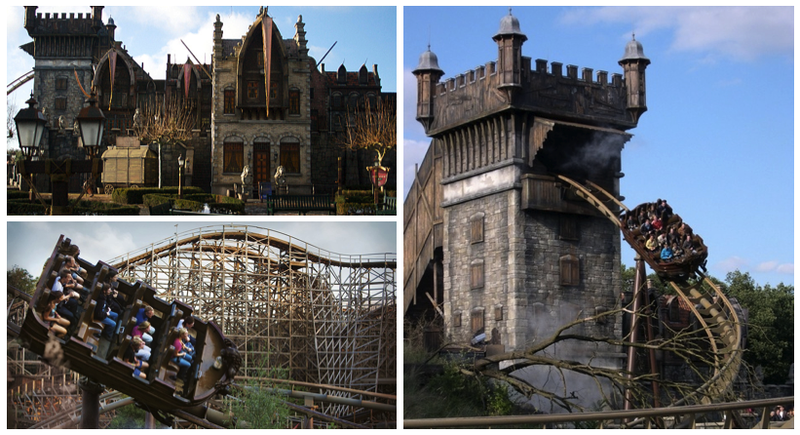 #Ruigrijk (Rough Kingdom): is located in the east, has a number of attractions, Baron 1898, Joris and the Dragon and the The Flying Dutchman are some of the very popular (ofcourse, rough!!)rides. #Fantasierijk (Fantasy Kingdom) : lies in the middle of the park, probably the first one most of us reach. It consists of Polles Cuisine, Aquanura and the very new Symbolica! #Anderrijk(Alternative Kingdom): is in the south, this houses the famous Piraña, Ghost Castle, and Panda Dream. Efteling mobile app can be very useful, especially they give live update on tracking/navigation w and waiting time of each of the attractions. 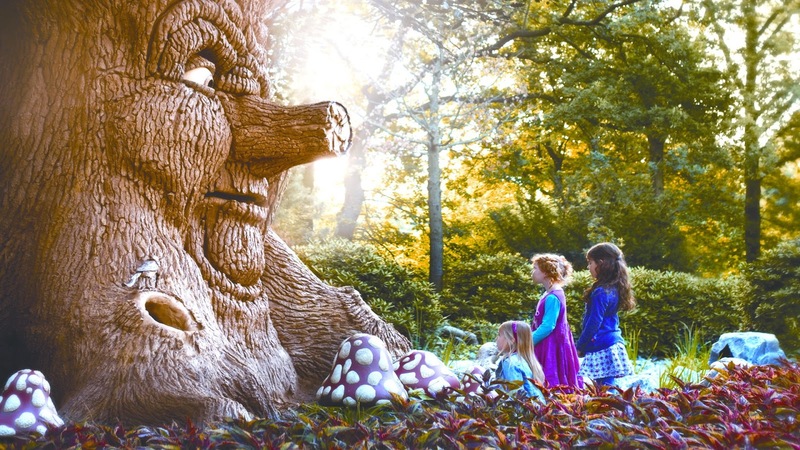 Sprookjesbos (also called as Fairytale forest) and the Droomvlucht (Dream Flight) are the two major attractions in the Marerijk (Fairy-tale kingdom) of Efteling. The Sprookjesbos is one of the biggest attractions in the Efteling theme park, designed in a dense green of 6 hectares area!.... It’s also the first attraction in the park and that’s exisiting since the first day of Efteling on May 31, 1952. Ofcourse, it went (and still going through) changes every year. I heard that the Sprookjesbos had the themes/scenes of only 10 fairy tales in the beginning and now there are whooping 29 tales seen alive. Cindrella, Chinese Nightingale, Dragons, Fakir, Wolf & seven kids, Sleeping beauty, Hansel & Gretel, Frog Princess, Little mermaid, Rapunzel Little red riding hood, Snow white…. are a few tales to mention. They’re all not just exhibited, but the whole story is lively illustrated in moving statues, more like a live stage drama. Droomvlucht (also called as Dream flight) is the other super-star of Efteling . The Dream Flight is a #darkride where floating gondolas take you all over a magical fairy world, for about 10 minutes. Each cabin is designed to accommodate 2-3 people, was perfect for my family. Your dream flight starts through a dark cave and taken-off to a majestic castle, between the low-lying mists, rocks, and waterfalls. With a quiet music and lots of harp and wind instrument effects, you'll feel that you’re transported to a distant dream world, for sure. My words wont’ be sufficient to express the whole scene. Why don’t you feel it from this video!. I know you’ll definitely thank me 😊. I am not big fan of rides (especially the rough ones). De Vliegende Hollander / The Flying Dutchman stands at the wilder attractions of the Efteling in Ruigrijk (Rough Kingdom), but hard to bring it in that category. In-fact I still can’t classify what kind of ride it is! An indoor dark ride, a fantasy thrill journey, water coaster, outdoor rollercoaster, …it has all of them nicely blended together to give an unforgettable ride experience of ones’ life time. Like any other Efteling attraction, The Flying Dutchman is too stunningly themed that will awe-strike from the moment you enter. The building is designed as a Holland’s city from the 17th century. You walk through the dark port area and seated in a dusky 14 seater boat. The boat seats are designed in a theatre set-up, so that everyone gets the whole 360deg view. When everyone is seated, our hip braces were closed, the boat started to sail slowly from the dark port towards the dark open sea. That grim music in the background just made us dissolved in to that suspense atmosphere. Then there was a dreadful lightning and thunder on the dark sky above us. The fog around us was getting thicker and thicker as the music was getting so intense. Suddenly it started to rain hard and we’re all drenched while the boat moved vertically speedily (we almost screamed at that moment). There came a bit of relief, the boat came out of the darkness. Before even we came to senses, the boat again fell down at a speed of 70 kilometers per hour in a tunnel filled with smoke. I didn’t even know how we crossed those multiple 45 degree curves and bumps; within seconds, we’re in a final splashdown followed by a relaxing glide back to the port where we started. As I said earlier, whether you’re a fan of rides or not, you’ll definitely become big a big fan of the “Flying Dutch man”, it’s truly an unique experience that will stay in your memory for ever! 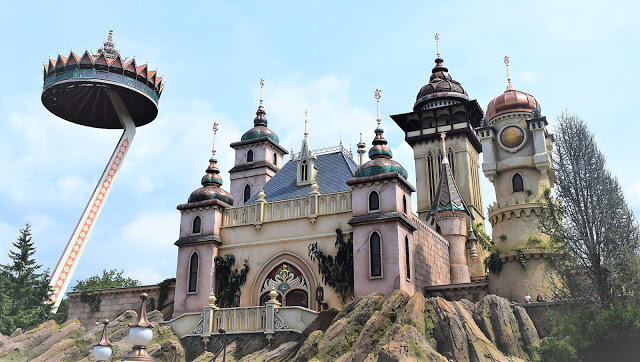 Symbolica: This is the latest addition to the wonders of Efteling. This fantasy dark ride started from 1st of July 2017 and we’re there within the first few weeks. (You can imagine, how much time we’d have stood in the queue😁). The story line is simple : we-all the visitors go to audition with the king Pardulfus. (In 7 minutes of total ride it's difficult to unfold a complex story line, isn’t it?) ; probably they might expand the story as well ride later!). Never the less, these 7-minutes are worth enough (for all the hours of wait at the entrance 😁 ), and there’s definitely a lot to see. 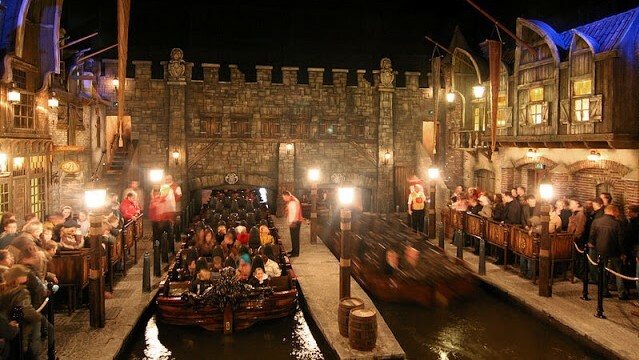 Same as any other dark ride, you’re seated in safe & comfortable moving gondolas, then you’re transported all through the palace on invisible rails. You fly, you float, you roll, you jump - forward, backward and in sideways. You’re sure to scream in joy (as well in shock at a few moments). Are you with the children in Symbolica? Yes, kins will love it, but be ware that the children under 1 meter need a supervisor. You'd always pick adequate seater accordingly. Do not put efforts to make any pictures or videos inside. It is NOT prohibited, but I personally feel that there is so much to see/experience and enjoy in live. After all seeing this wonder on screens is not that exciting. Aquanura is a spectacular musical fountain show, with special effects of more than 200 fountains, 900+ lights, with matching music beats and fire. It’s created with a theme of the “Frog King”, 4 frogs from different directions bring enchanting Efteling fairy tales to life”. The color of #aquanura is beautiful to watch in the dark. With the interactive Efteling app on your smartphone, visitors around the pond can even be part of this special 12-minute spectacle. During the holidays, there are two performances of Aquanura daily: the tradional Aquanura show and the 2nd Efteling Symphony.